The holidays are a great time to play fun holiday games with family and friends. How well do you know Christmas carols? 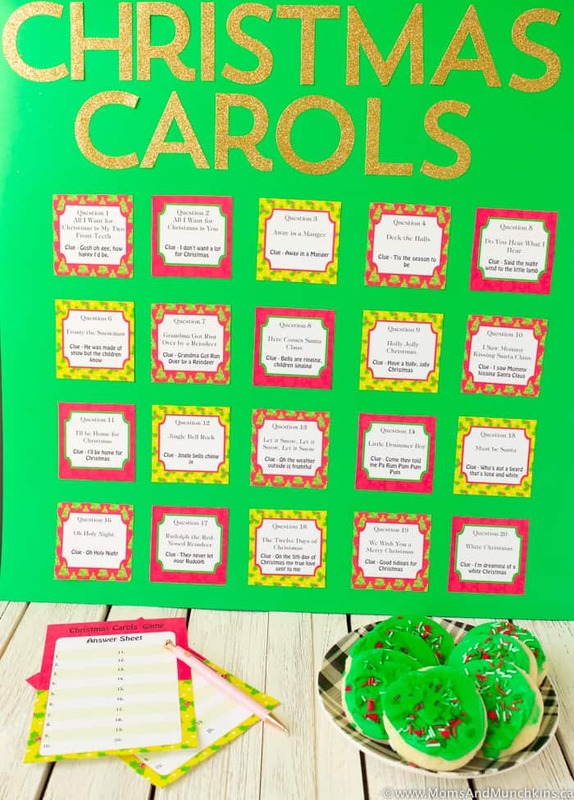 This fun Christmas Carol Game will test your memory and your singing talents! This post has been so popular that we now have two versions available for you to print. There is the original 1-page document shown below and now we have a multi-page document that you can print, cut out and display on a poster board (great for a larger party). Click the picture above to print the free 1-page game. 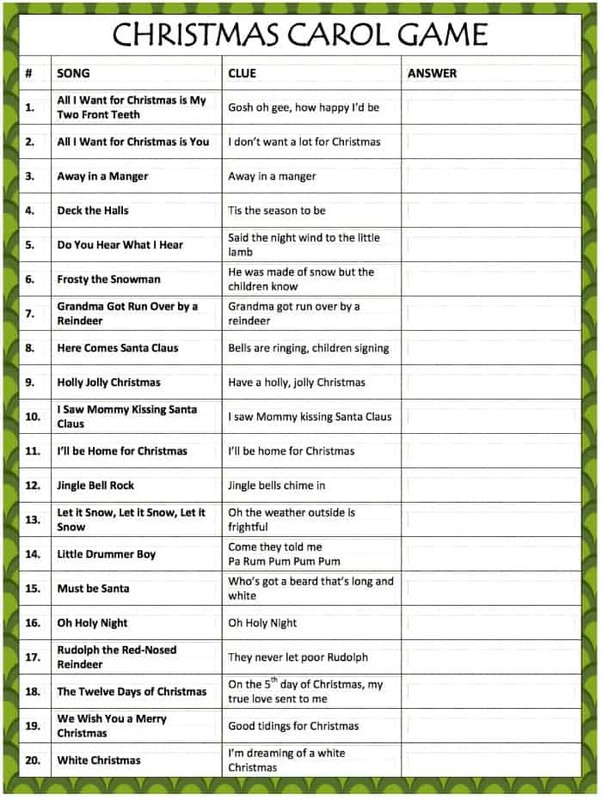 How many of these Christmas carols do you recognize? 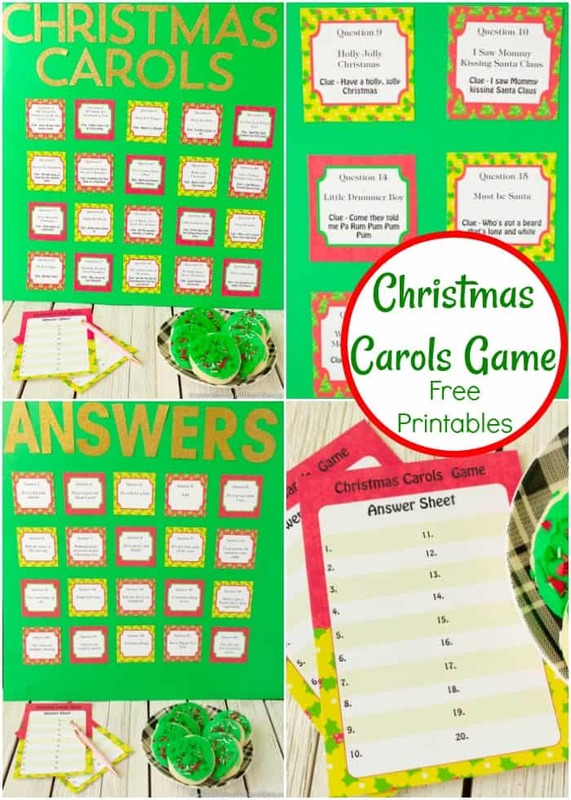 The answers are on page two of the free Christmas printable game. To play this game, simply print out the question & answer sheets and read out the questions. Start by telling everyone the song and then read the “clue” line. The first person to respond by signing the correct answer (the next line of the song) gets one point. The player with the most points at the end of the game wins! Print all the pages, cut out the squares for all 20 questions and answers and tape them onto a poster board. All questions with clues on one side and all answers on the back side of the poster board. This version also comes with printable game cards so guests can read the questions with clues and write down their answers on the game cards. You can later flip the board over and read the answers out loud or let guests check their own answers. Planning a Holiday Baking party or just looking for some delicious Christmas dessert recipes? 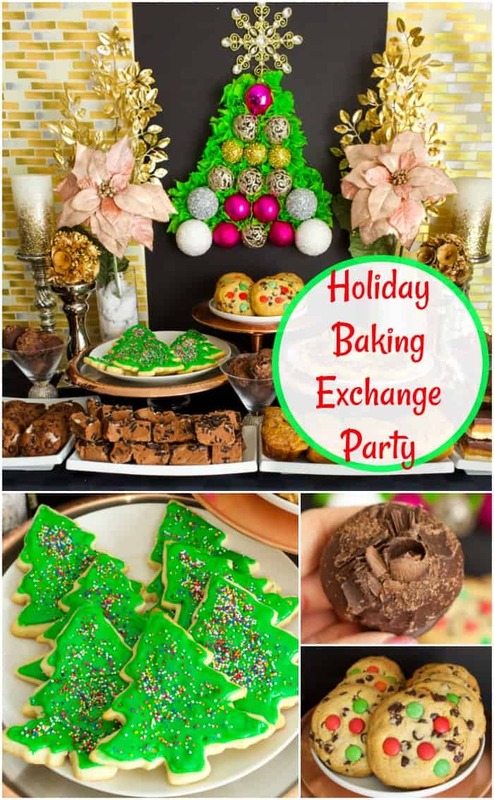 Check out these Holiday Baking Exchange party ideas including my FAVORITE recipe for Millionaire Bars – yum! 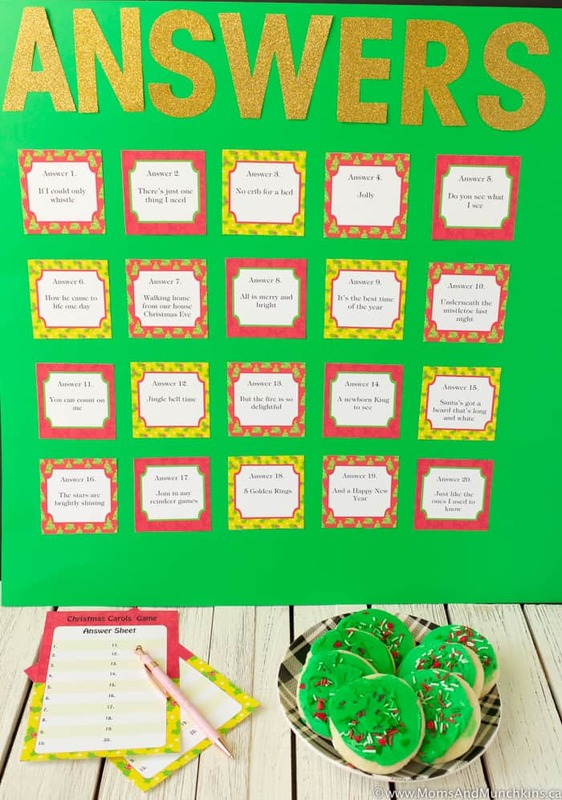 Looking for more fun & free printable Christmas games? Visit our special Christmas Fun page. There you’ll find more Christmas games like scavenger hunts, charades, word scrambles, word searches, trivia and more! 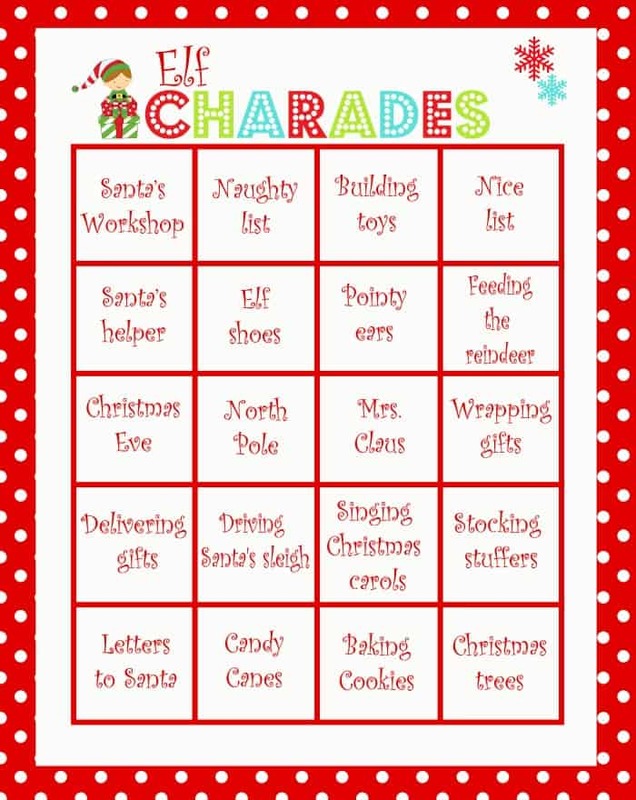 Here’s a little sneak peek for you – FREE printable Elf Charades game! 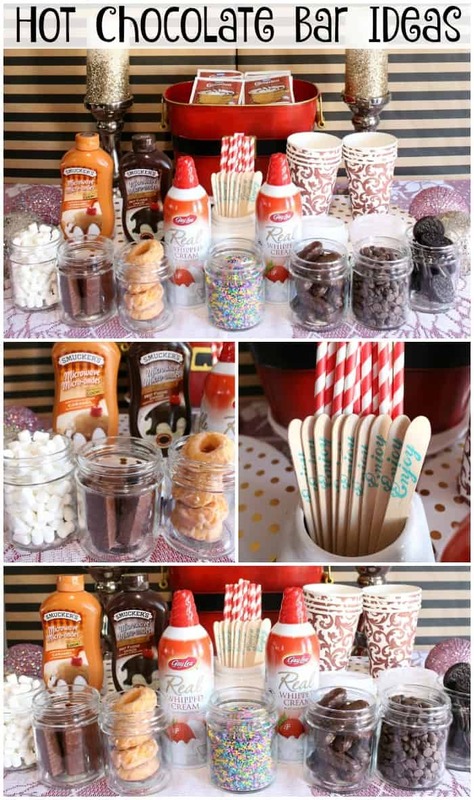 If you’re looking for a sweet treat table for your party, here’s one all ages will love – Hot Chocolate Bar! We have lots of yummy ideas for all ages! To stay updated on the latest ideas for holiday fun, follow us on Facebook, Twitter, and Pinterest. What a fun game!!! I’m sure it would make for a lot of cute answers and many laughs. The cute answers are always the best! I love this game!!! I tried playing it and was surprised at how many I couldn’t answer. I had to cheat and look at the answer below (thank you for supplying BTW). That was fun!!! We’ve been listening to Christmas music in the car since the snow started to fall so my 2 year old could actually get at least half of those right! It’s amazing how much she retains. I don’t think she’s ever hear Grandma Got Run Over by a Reindeer though – that one would probably traumatize her a bit 😉 Fun game. I might modify it with more songs she knows and see how she does! What a fun game to play for the Holidays! My mom always seems to have great activities like this for my kids when we are in the car and need to divert the kids. Oh I love these!! I have not seen this one before, I’m going to have to try this at one of our gatherings! Some of those were a real test for me. What a fun game, just in time for the holidays. Okay I will admit I found myself suddenly singing lol… This game looks like fun and I pinned it to our guide! Thanks for sharing and I even got some right. I love this! What a great Christmas activity! Thanks for sharing at our Mommy Club Resources and Solution party last week! Hope to see you there again! Thank you for stopping by, Chrissy! I’m sorry! I found it. Thanks for a fun game. Our Church will love it! Great Ideas! The games sound like a lot of fun! Thank you, Juanita! Happy Holidays! Thank you for this wonderful gift! Our ladies group at the church will enjoy I’m sure!! !